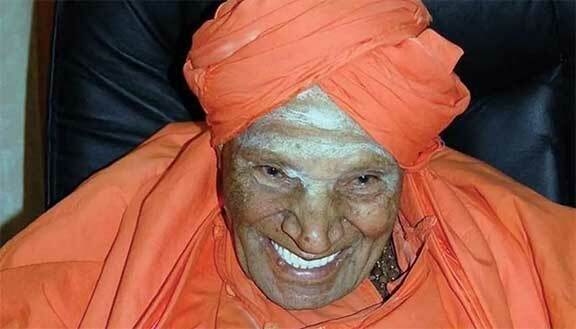 Tumakuru: The 111-year old pontiff of the Siddaganga Mutt Dr Sivakumara Swamiji passed away on Monday due to lung infection and other age-related ailments at his mutt in Tumakuru. Chief Minister HD Kumaraswamy cancelled his scheduled visit to Hirekerur today and arrived at Tumakuru mutt. Regular morning prayer at 6.45 AM was cancelled due to fluctuations in Swamiji’s health, informed sources. Former chief minister BS Yeddyurappa and Deputy Chief Minister G Parameshwara arrived at the present Siddaganga Matt where Shivakumara Swamiji was under treatment. Swamiji was born on 1 April 1907 in Veerapura near Magadi Taluk, Ramanagara District. He was initiated into the Viraktashram Order in 1930. Known as ‘Nadedaduva Devaru’ (Walking God), Swamiji is a Lingayat religious figure and humanitarian. The seer was widely respected for his social service, particularly in the field of education. On December 1, the seer was admitted to the BGS Gleneagles Global Hospitals and underwent certain procedures, including implant of stents in the common bile duct. Subsequently, he was discharged but continued to remain on observation and medication. Mutt authorities along with a team of expert surgeons from Chennai and Bengaluru had then decided to shift him to Chennai for further surgical intervention after the seer fell ill. Internationally renowned hepatobiliary (related to liver, gallbladder and bile ducts) surgeon Dr Mohamed Rela of the Rela Institute and Medical Centre treated the seer and performed the Surgery on the seer. He was brought back to the Mutt after showed signs of recovery and was later admitted to Siddaganga Hospital and Research Centre. Following the seers’ insistence, he was shifted to the Mutt on January 16 and had been placed on a ventilator in the makeshift ICU set up at the Mutt premises.